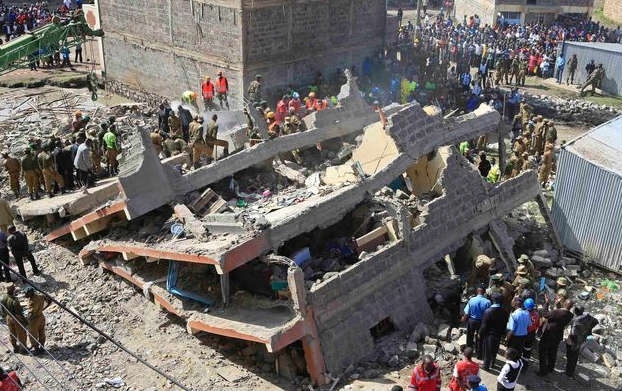 A BABY girl has been rescued from rubble after a building collapsed four days ago in Nairobi. The six month old baby, named Dealeryn Saisi Wasike was eventually reunited with her father and remarkably had no physical injuries. At least 23 people were killed after the six-storey residence came down in heavy rain. With dozens of people still estimated to be trapped under the debris, hopes are beginning to fade of finding more alive. The building’s owner, Samuel Karanja Kamau was arrested on Monday after officials say he illegally rented the building out after it was due for demolition. He is due to appear in court on Tuesday charged with manslaughter. He has not yet commented on the allegations. In all about 135 people have been freed so far from the building ruins with another 93 still reported as missing. The baby girl was found at 4am local time, in a bucket, wrapped in a blanket, according the Kenyan Red Cross. Other than being dehydrated she had no visible injuries and was rushed to the local hospital for treatment. The Kenyan Red Cross later tweeted that it had located the baby’s father, Ralson Saisi Wasike who was then reunited with his daughter. Further bodies were found overnight.